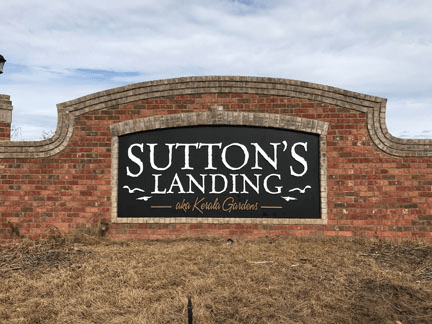 Did you know you don’t have to completely replace your existing community entrance sign? Modern technology and materials allow cost-effective solutions to save your community HOA Budget. 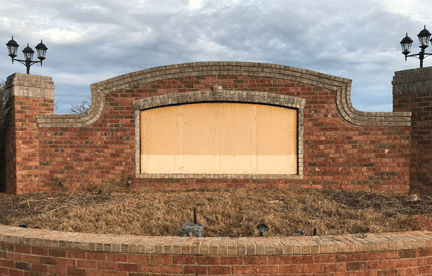 Recycle Existing Community Entrance Signs! 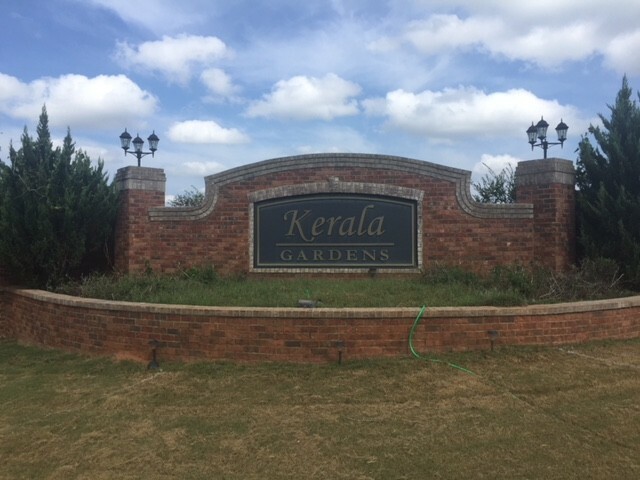 This golf course community decided to change the name with new ownership. 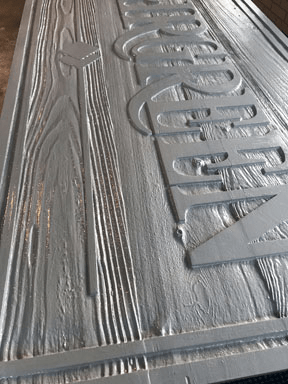 The existing signage was fortunately in HDU (High Density Urethane aka “Sign Foam”). We suggested they remove the old sign panel inserts and flip them over, and we provided this new design. 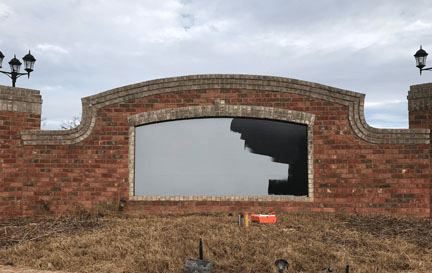 Once the sign panel was flipped, the HDU was primed and all screw holes were patched by Property Management. 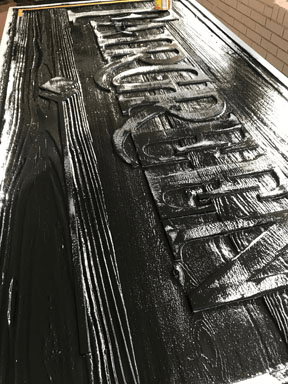 Now patched, the existing HDU sign panel was primed, then painted in a flat black commercial sign enamel. Professional Tip: Have your paint supplier tint the white primer (in this case, gray) to make your top coat a single application. 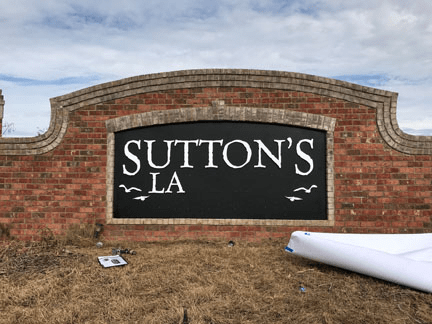 Sutton’s Landing Flipped Sign Background Painted. We designed and produced computer routed graphics with a paper template indicating where to drill. Paper Template Removed and Graphics Being Installed. And here are the final results, which saved half the costs of replacing with new sign panels. The sign was first sanded, then patched with wood filler in all gaps (it was an outdated wooden sign), and prepared for primer. 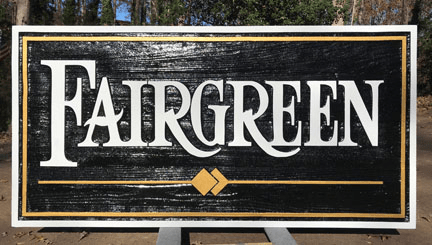 FairGreen Old Sandblasted Sign Cleaned & Primed. Once primed (wood takes a minimum of (2) coats), the background color can be applied. 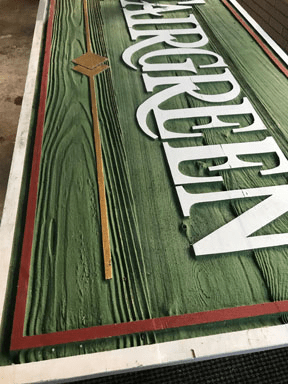 FairGreen Sandblasted Sign Background Painted. And here are the final results after using 1Shot! Commercial Sign Enamels (which we provide). This entry was posted in Commercial Signs, Monument Signs, Property Developer Signs, Residential Signs by BSM Staff. Bookmark the permalink.